It’s A Boy! Blue Nursery Bedding. My husband and I just found out that we are expecting a boy! Finally, we can begin to plan for his arrival and create a registry to help with some of the essentials. 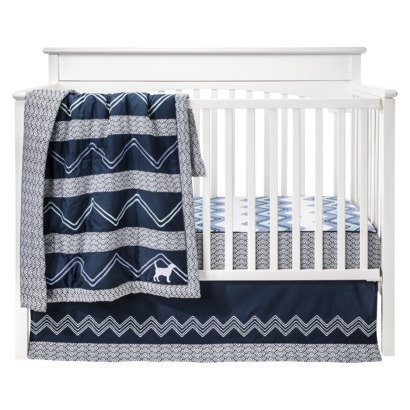 I posted previously that I really liked neutral colors for nurseries, but my husband REALLY wants blue to be a staple in the room so…here are a few of my faves in the “boy bedding” category. Another favorite is the Leo Collection from Serena and Lily. It’s a little pricier at $312 for the entire set, but the adorable prints make it well worth it! Plus, you can mix and match patterns and order free swatches of the fabric to see colors before purchasing. 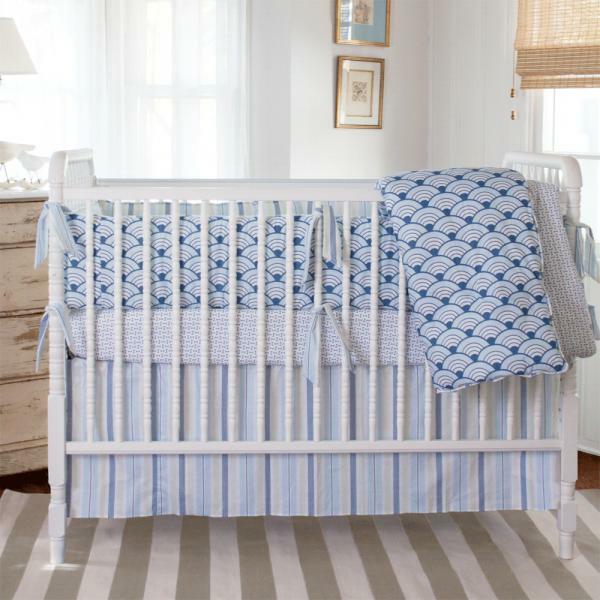 I love the wave pattern in this nursery collection from Annette Tatum, which costs $280 for the entire set. There are a TON of adorable options out there…it all just depends on how much you’re looking to spend. I, personally, don’t think it makes sense to spend $300+ dollars on bedding that will only be used for a year or so. 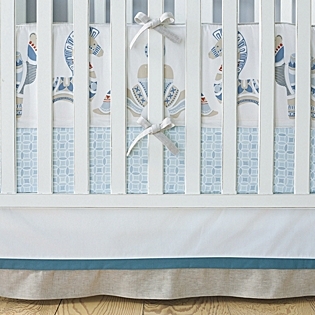 With that said, it’s easy to fall in love with the precious prints and colors in the nursery category. To save a little money, I recommend buying a fitted sheet and bumper to start- a bed skirt might not be necessary depending on the style of crib you have. The quilt isn’t necessary to use for a newborn because it can be dangerous, so this purchase can be delayed for some time. Shop Etsy! There are lots of great options on Etsy for more affordable prices and although they might not be complete sets, you can mix and match to create your own look. Make it (or some of it) a DIY project. Take advantage of online resources and sew your own bumper or bed skirt- there are some easy-to-follow tutorials out there, it may just take a little more time!